Researchers say fantasizing about a spicier or sloppier sandwich is extremely common, particularly among those who have a regular sandwich order they eat every day. BOULDER, CO—Saying such feelings of desire were observed in nearly every individual they studied, psychologists from the University of Colorado released a report Thursday concluding that it is perfectly natural for people to fantasize about sandwiches other than the one presently in their hands. The study, which surveyed more than 500 adults from a variety of socioeconomic and ethnic backgrounds, determined that 89 percent of subjects had, at least once during the previous six months, vividly imagined a different sandwich while sitting down at the table with their current hero, hoagie, or po’ boy. According to the research team, it is particularly common for individuals to indulge in fantasies about exotic sandwiches from foreign culinary traditions, like Cubans or Vietnamese bánh mìs, that they have never tried before. Additionally, Sohn said that many subjects reported finding themselves particularly drawn to bigger, beefier sandwiches or those with larger meatballs, often causing them to imagine these alluring features on their own, plainer sandwich when they later sit down for a meal. Researchers also explained that, on average, a person imagines a different sandwich than the one they’re currently holding about once every week, though a sizable minority of respondents reportedly acknowledged engaging in such fantasies every single time they had lunch. “The real danger lies in unnecessarily punishing oneself for these thoughts, which can eventually diminish the gratification one derives from eating sandwiches altogether,” she continued. Sohn further assured the public that it was normal for such fantasies to become extremely vivid and complex. In particular, she noted that 63 percent of subjects had reported that on one or more occasions, they had imagined themselves eating their desired sandwich in an uncommon location, such as in a car, aboard a plane, or even in front of other people in public. Experts also confirmed that more atypical fantasies, such as eating a sandwich in a hot tub or devouring two sandwiches at once, were, in most cases, perfectly normal as well. 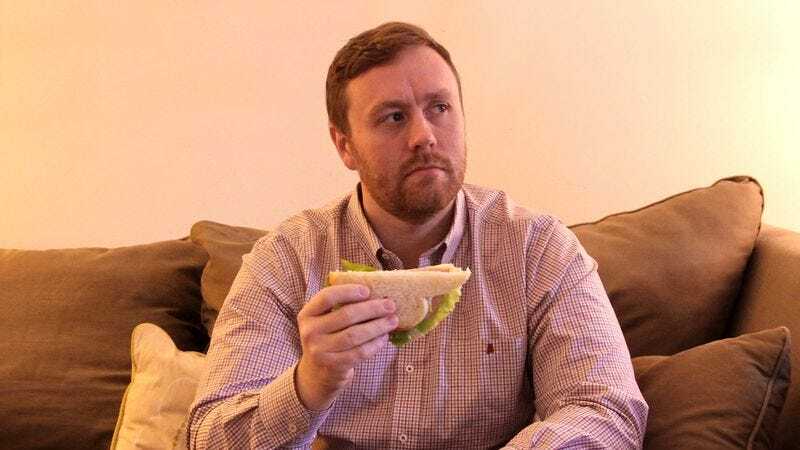 Researchers stated that a small percentage of deeply troubled individuals reported fantasizing about salads while eating their sandwiches, and recommended that anyone experiencing these types of perverse, abnormal thoughts immediately seek psychological counseling.